Simply click on the systray camera icon or press CTRL+F12 and a transparent green window will popup allowing you to take a screenshot of any portion of the screen! 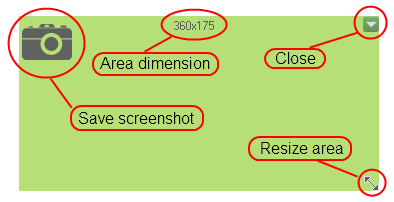 Use the mouse (or keyboard) to move the window and resize it, then click on the camera image to automatically save the area under the window. 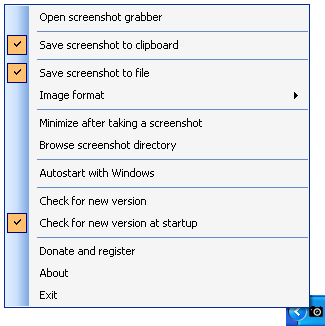 Screenshots can be saved in the clipboard and/or on the disk (png or jpg format). This software is very useful to save images of "unsalvable" pictures embedded in flash galleries. - added a new option: "remember last grab size on startup"